When attached, the supporting straps will automatically raise or lower the luggage compartment cover when you open or close the tailgate. Light items of clothing can be stowed on the luggage compartment cover. Please ensure that the view to the rear of the vehicle is not obstructed. Unhook the supporting straps from the tailgate (upper arrows). Press the luggage compartment cover upwards out of the side retainers (lower arrows). 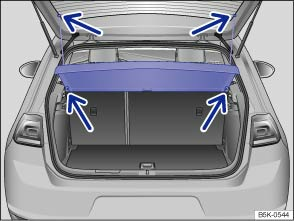 If required, the luggage compartment cover can be stowed under the variable luggage compartment floor . Push the luggage compartment cover into the side retainers from above (lower arrows). Hook the supporting straps onto the tailgate (upper arrows). Objects that are not secured or are secured incorrectly, or animals on the luggage compartment cover, could cause serious injuries in any sudden driving or braking manoeuvre or accident. Do not stow any hard, heavy or sharp items either loose or in bags on the luggage compartment cover. Never transport pets on the luggage compartment cover. To prevent damage to the luggage compartment cover, do not load it to such a height that the load will press against the luggage compartment cover when the tailgate is closed.